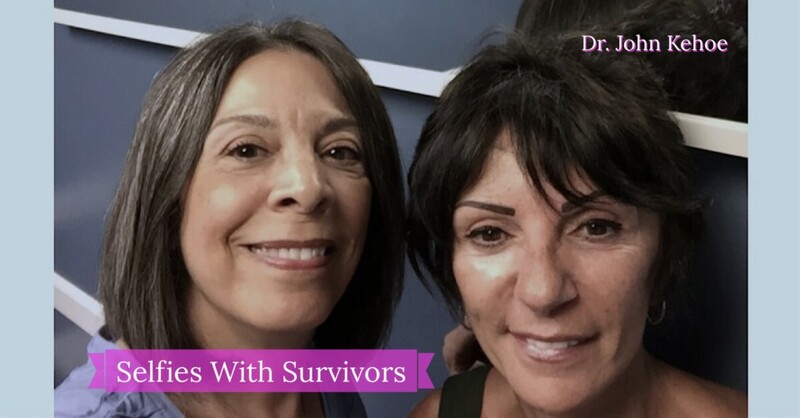 The role of estrogen replacement therapy in the development of breast cancer remains controversial, but not for this survivor (pictured on the right). Now she takes estrogen blockers. IN HER OWN WORDS: I am 64 years old. When I turned 60 in June 2013 I thought it was going to be a special year. My daughter was having her first child and this was such a joy and blessing I was due for a mammogram in the month of August but something didn’t feel right to me. So I insisted on getting my test a month sooner. Lo and behold something showed up and I was given the name of Dr. Kehoe to check out my situation. I had stage one breast cancer in the left breast and I truly believe it was due to taking hormonal replacement for too many years. I had to get a hysterectomy in my early 30’s after my daughter was born. I took estrogen for many years because the doctor felt I was too young to go through a menopause. It was a great pill at the time but all medications have a side affect. So it finally caught up to me. The cancer was estrogen positive. When Dr. Kehoe gave me the news it was like someone was bunching me in the face. Although he was explaining my situation, everything was a blur. I immediately made the decision to get a full mastectomy of both breasts. I had four treatments of chemotherapy and I had reconstructive surgery. It is now going on four years and I have been cancer free so far. I exercise, eat organic for the most part, and always make sure I pay close attention to my body on any changes that I feel should be examined. It’s a very scary situation because every ache or headache is a fear that it is cancer related. I am taking a hormonal blocker and I tolerate it pretty well. I have to get infusions twice a year to help my bones from weakening. I now have three beautiful grandchildren. I still work and hope to retire in the next year or two. It’s been a long and scary journey but at the same time I feel blessed that I am sitting here writing my little story. Thinking positive is the key and the support of family. My husband has been my rock and both children and grandchildren are my medicine of cure..